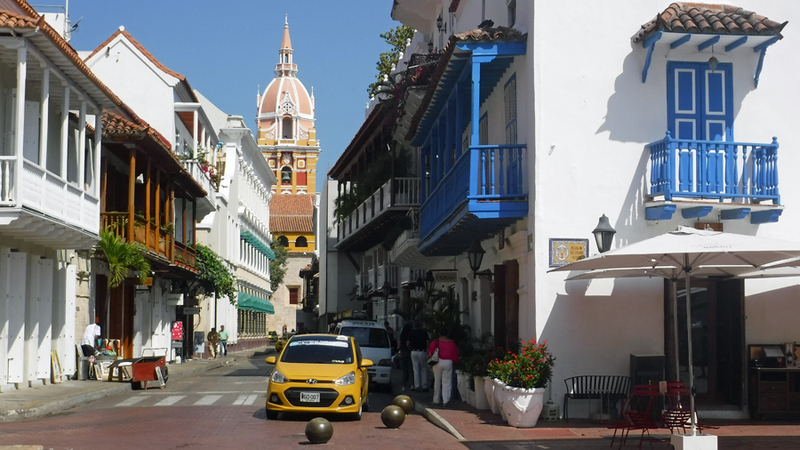 Our choice to stay in a hotel in Cartagena proved to be the right move. This is because we found ourselves in the heart of the Bocagrande area. It is a touristy area due to the long beaches on both the ocean and bay sides of the peninsular. 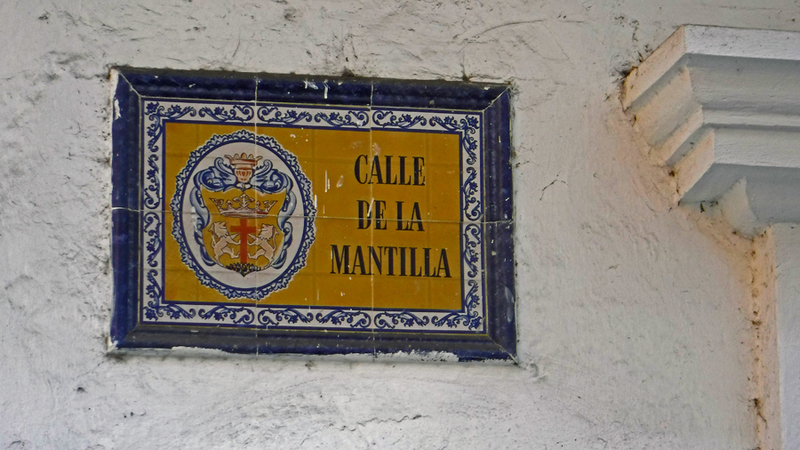 Within a few blocks of the hotel were several highly rated restaurants. On our first day, we grabbed lunch inside the Walled City. I thought it would be nice to sit outside (in the shade) and watch the tourists walk by as we ate. We like to people watch. This proved to be a bad idea. The food was not good and we were endlessly interrupted by street vendors. We don’t mind the vendors but would like to eat in peace. 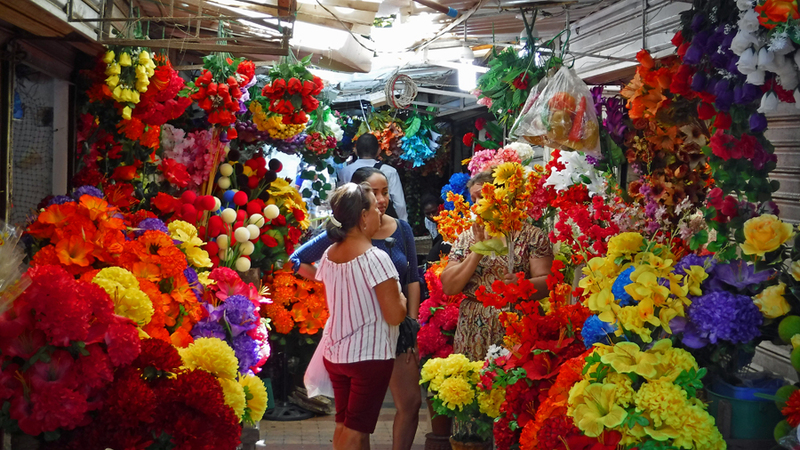 We decided then to limit ourselves to eating in the area of our hotel where we found the food and selection to be much better, cheaper and quieter. Also, most restaurants in the area of our hotel offered menus in English. Eating lunch here was a mistake. The view was good but not the food. Outside of the hotel we talked to Tony who tried to sell us sunglasses, even though we were both wearing them at the time. Then, he tried to sell us a hat each. Yep, you guessed it; we were both wearing hats. He said his hats have “Colombia” written on them. I told him my hat had “Tilly” written on it. We had a good laugh. Tony’s English was really good so we chatted with him about the area. We found he works the same area seven days a week and has a wife and seven kids to support. He told us about the seven kids later when he knew we were not going to buy anything. So, I’m pretty sure it wasn’t to get a sympathy purchase from us. I imagine Tony is a pretty good salesman to support a family with his portable store. We give him an A+ for persistence and an A++ for personality. Each day as we exit or enter the hotel, Tony is there to say hello. We did a very touristy thing on our first two days. Cindy, our ever frugal entertainment director, purchased tickets for the double-decker hop-on hop-off bus. The bus makes fourteen stops at various city areas of interest. The tickets are for two days. As luck would have it, one of the stops was at the McDonald’s a couple of blocks from our hotel. We thought we’d get the lay of the land from the bus stops and if any area warranted further exploration we could return by taxi after the tickets expired. Cindy found if she purchased the tickets on the local Colombia website rather than the international dot-com site, she could save about 50% from what other tourists were paying. 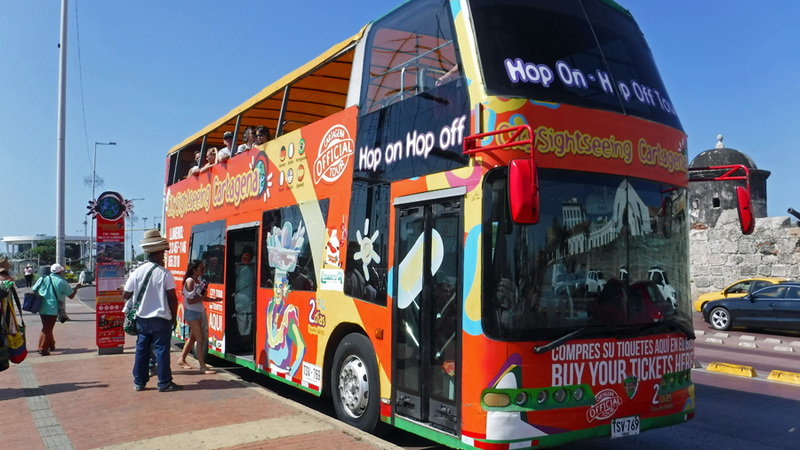 If you are in Cartagena and wish to ride the hop-on hop-off bus, buy your tickets from here. 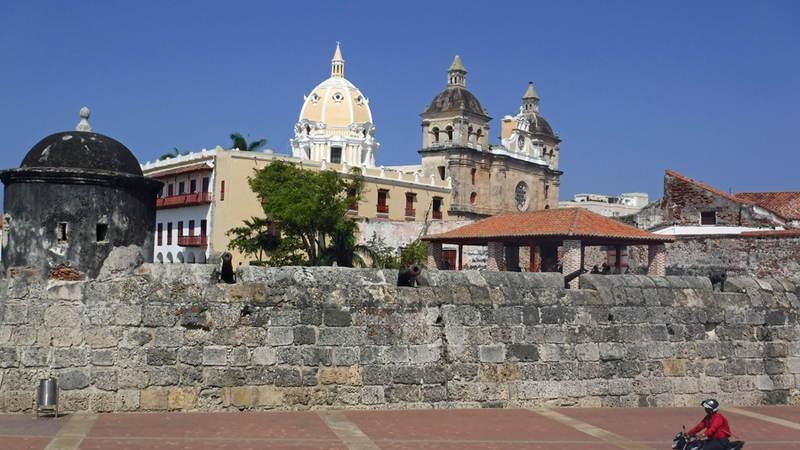 The old Walled City of Cartagena is simply beautiful. 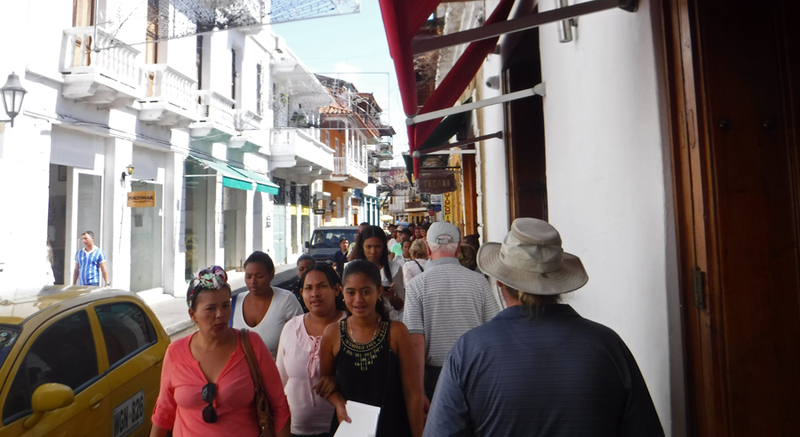 It is by far the best preserved colonial city we have ever visited. It is no wonder millions of tourists come here every year. Strolling down the narrow streets surrounded by 400+ year old buildings was an incredible experience I will cherish forever. We spent the first couple days roaming about aimlessly just taking in the sights. During our walkabout, we’re setting up a plan of the area attractions to revisit and spend a little more time. 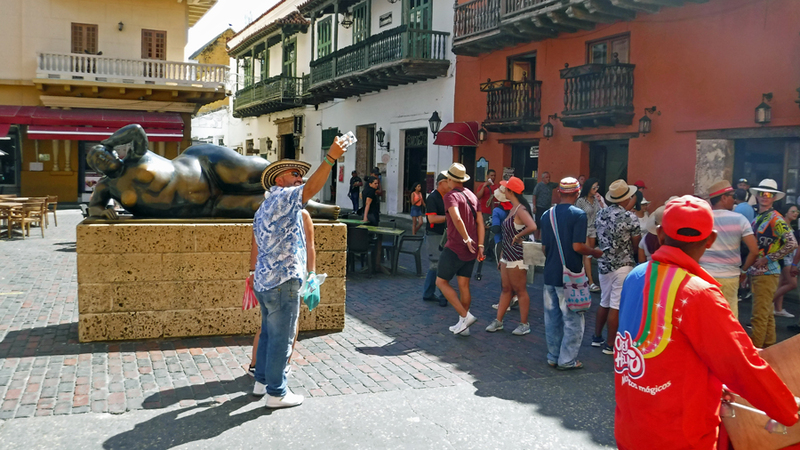 High on the list is a historic walking tour of the Walled City and also the Castillo de San Felipe de Barajas, a large fort. We also wanted to go to the Gold Museum but found it was closed for renovations, oh well, plenty of other stuff to do here. 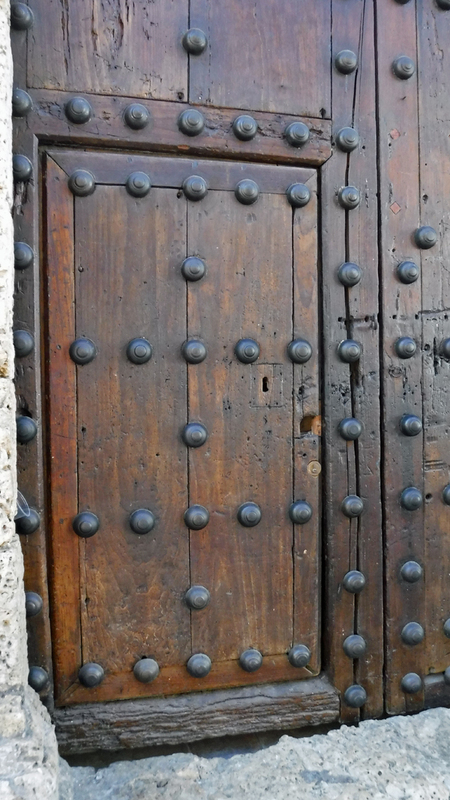 I wonder how old this door is? Note how the pedestrians are on the shady side. It is really hot here! 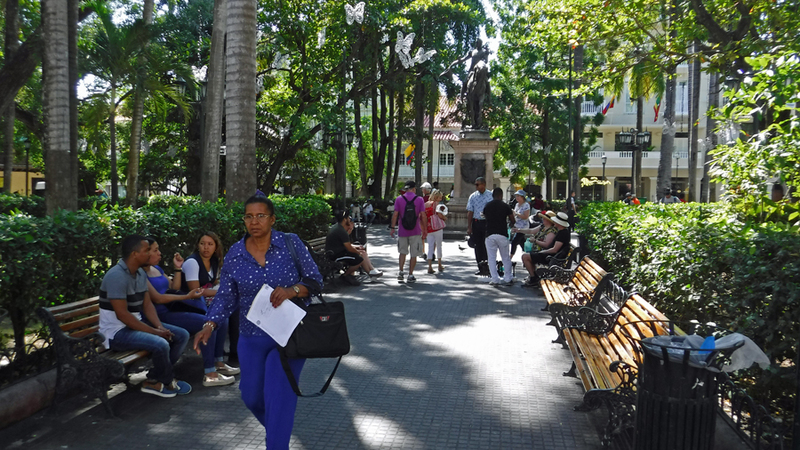 Just outside of the Walled City is a small park called Parque Del Centenario. This was a destination for us since a fellow cruiser told us the park had some sloths in the trees. I have never seen a sloth outside of a zoo. When I get reincarnated, I want to come back as a sloth. Can you imagine having such a stress free slow moving life? I’d be a really great sloth! There is more to this sloth hunt story. Keep reading. 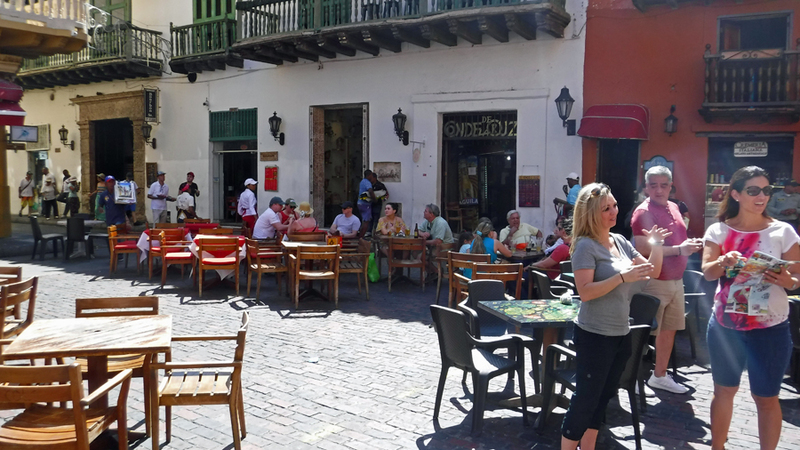 While taking a break inside the Walled City, Cindy and I parked ourselves on a bench in the Plaza de Bolívar park and flagged down a vendor selling cold bottled water. The only bench open in the shade was to be shared with a lady who had a Jehovah’s Witness stand set up. Not sure if she spoke English, I asked her if we could share the bench. Her name is Betty and she is from Minnesota. She has been a missionary worker in Colombia for four years. She said she loves to get away from the cold temperatures and the snow in her home state. I told her I thought she’d overdone it a little bit looking for a warmer country. We chatted with Betty for about 20 minutes before she had to leave for a meeting. We sat for a little bit longer and once cooled off we slowly meandered our way toward the park. It was really nice to have a conversation with an English speaking person and Betty turned out to be a sweet and kind lady. 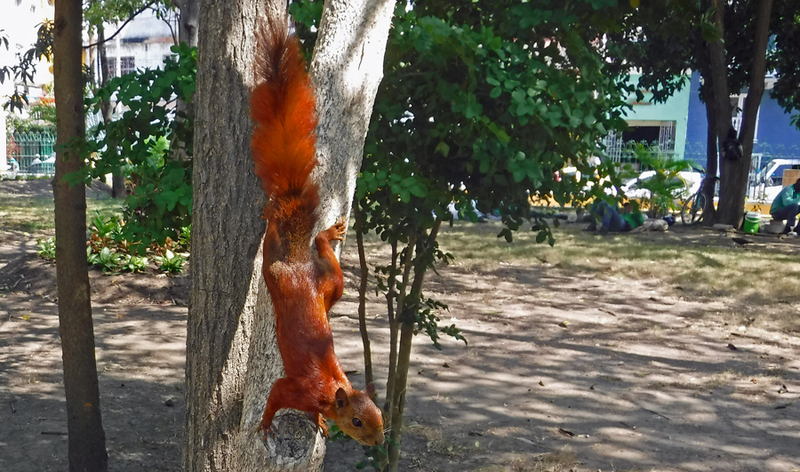 Besides hearing about sloths in the park, several other people mentioned monkeys there. We got completely turned around inside the historic area and had to use Google maps to find our way out of the wall on the side of the city with the park. After we entered the park it didn’t take long to find a sloth. We notice a small group of people pointing cameras and phones toward the tree. Eureka! Our first sloth sighting. We were so excited! 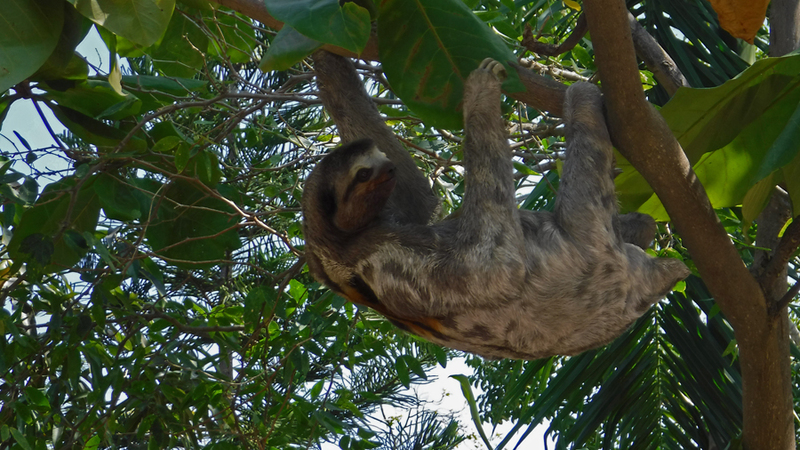 Lucky for us the sloth was awake and fairly active; well, about as active as a sloth gets. And, as an added bonus the mama sloth had a baby attached to her. Ahhh! Even baby sloths are cute as buttons. We roamed the park taking full advantage of the tree provided shade. This time our eyes were focusing on the tree branches looking for monkeys. Normally monkeys are pretty easy to spot since they shake the branches so much when they move about. A tidbit we learned after seeing our first wild monkey in Grenada. We were told these are small monkeys. Not knowing how small a monkey can be I wasn’t sure exactly what to expect. We had just about given up when Cindy noticed Betty walking toward us. Betty asked us if we had seen the baby sloth. 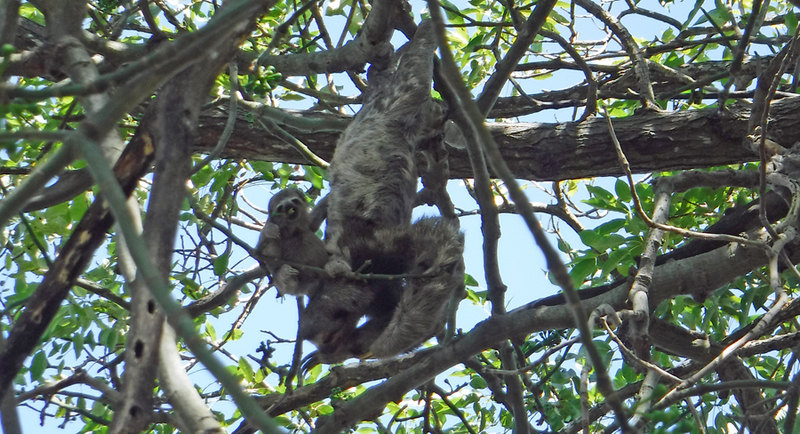 She told us one of the park caretakers mentioned to her the mama sloth was about ready to set the baby loose. Everyone was pretty excited about this. We told Betty we were hoping to see the monkeys in addition to the sloths but couldn’t seem to spot them. She said to follow her. Betty found Roberto who is a park caretaker. She introduced us and said if anyone could find the monkeys Roberto could. Roberto carried a small bag of mangos with him and the moment we walked into the area of the monkey’s habitat they watched him closely. The monkey’s hangout was a little off the beaten path. Roberto reached into his bag and pulled out a ripe mango and sliced it. Now the monkeys came down from the higher branches. They were fixated on the fresh juicy treat. Roberto handed me the mango slice and told me how to feed them without getting bitten. 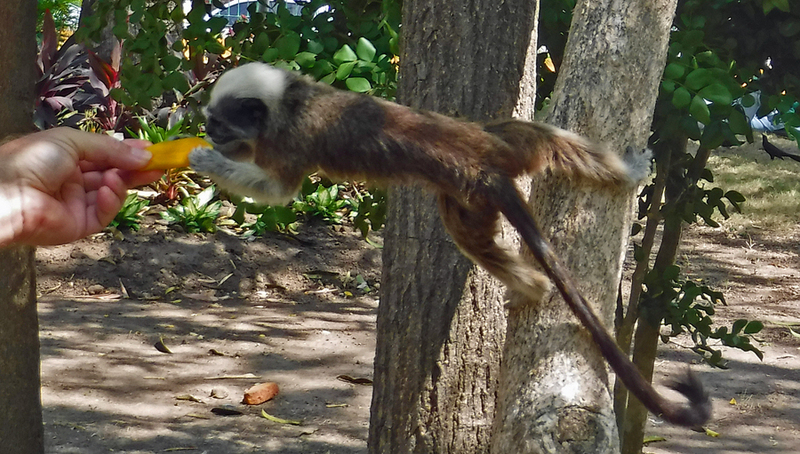 As soon as I reached out the cutest little monkey came down the tree trunk. It reached out and took the mango from my hand. Wow! I was just hoping to see a monkey. To actually feed one was not even something I had thought about. I gave Roberto a tip. 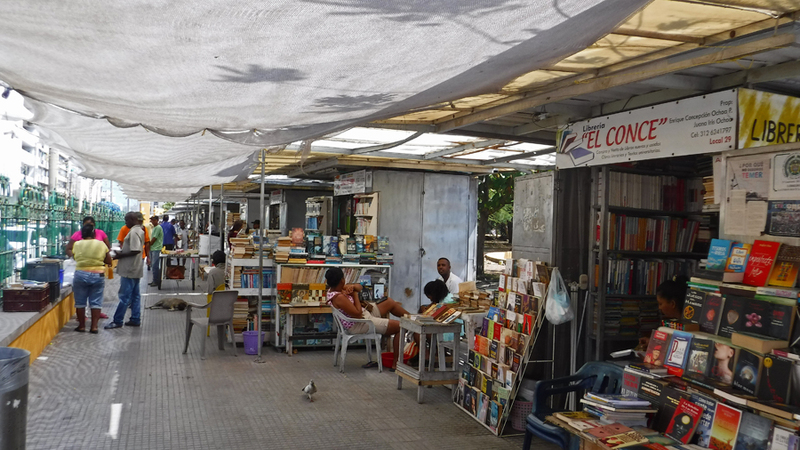 Nothing in Colombia is free. If someone does a service for you, a tip is expected. It doesn’t have to be a big amount. Even the smallest tips are appreciated. Roberto shook my hand and I tried to explain to him how he made my day. I think he understood. Cindy and I were talking later that day about how funny it is when the path one takes in life can have unexpected take your breath away moments. 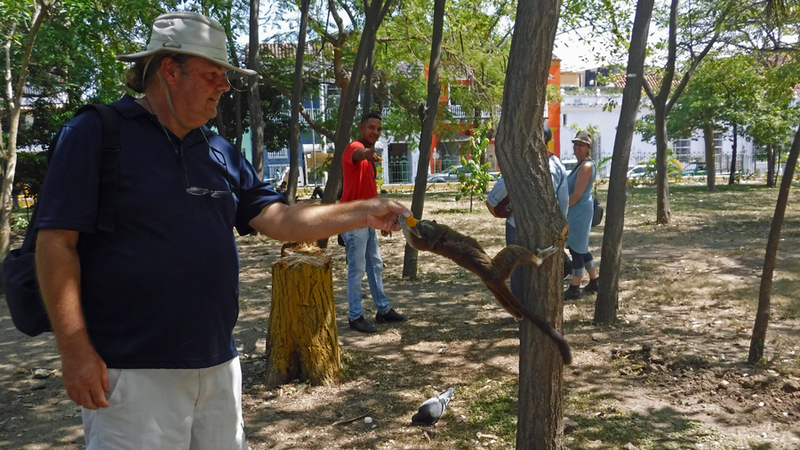 Had it not been for the people we met in Santa Marta who told us about the park, we would have never found it. It was not in any of the tourist information or brochures. In fact, the park was mostly full of local people taking a lunch break. Because of this we saw our very first wild sloths, a mama and baby. Had we not have chatted with Betty who took a break from spreading the word of the JW, we would not have met Roberto. Had it not have been for Roberto, we would not have found the monkeys and fed them. Roberto even had names for each of the monkeys. 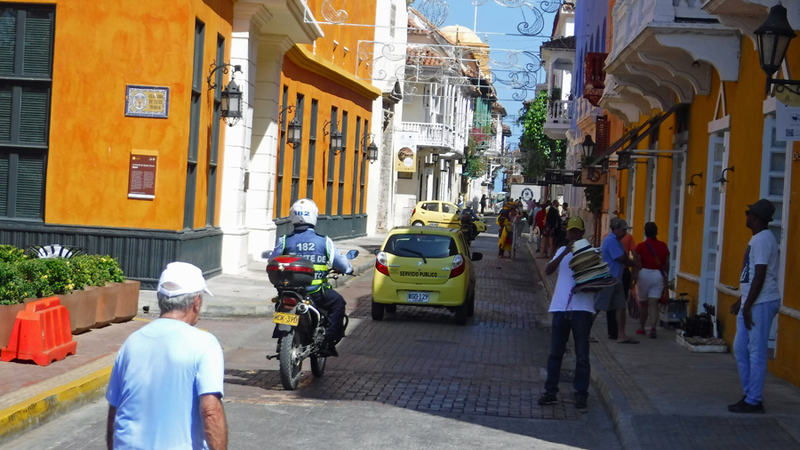 Life is good and we are loving our time in Cartagena.